Washington Savoyards 41st season opens with Richard O’Brien’s The Rocky Horror Show. VIPs from across DC lend their talents to the role of The Narrator during select performances throughout the run. 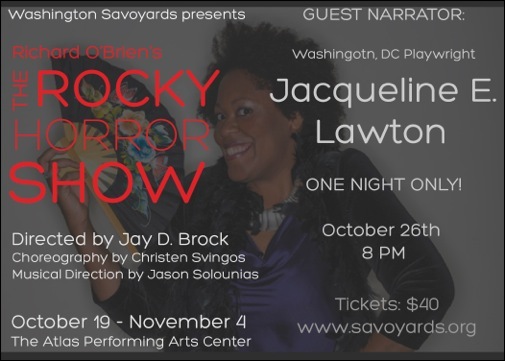 On Friday, October 26th DC Playwright, Jacqueline E. Lawton will make a One Night Only appearance and you won't want to miss her in action! Additional guest narrators include, Fox 5’s Emmy Award-winning weather forecaster Sue Palka, TheatreWashington Chairman Victor Shargai, Signature Theatre Artistic Director Eric Schaeffer, Adventure Theatre MTC’s Producing Artistic Director Michael J. Bobbitt, TV and radio personality Robert Aubry Davis, Executive Artistic Director of the New Musical Foundation Charlie Fink, Signature Theatre Associate Artistic Director Matthew Gardiner, and various members from DC’s Rocky Horror group Sonic Transducers. Gorgeous Gals. Thrills and chills. Transylvanian transvestites. In The Rocky Horror Show, two clean cut young people, Brad Majors and his fiancee Janet Weiss, run into trouble on their way to visit an old college professor. They seek help at the freaky Frankenstein mansion. However, little did they know that they mansion is inhabited by alien transsexuals from the planet Transylvania and Dr. Frank N. Furter is in the midst of one of his maniacal experiments. Click HERE to purchase tickets now. The Rocky Horror Show runs at the Atlas Performing Arts Center from October 19 to November 4. Best for mature audiences, tickets are $40 with a 10% discount for seniors and veterans, and may be purchased online at www.savoyards.org, or by phone at 202-399-7993. Public performances are Thursday-Friday at 8 PM, Saturday at 7 PM and 10 PM and Sunday at 5 PM.